Macknik and Martinez-Conde (who are a husband and wife team) collaborate with magicians and illusionists as they study illusions in order to shed light on the way our brains work and the way that we perceive the world. First a few definitions….An illusion is a subjective perception that does not match the real world. We may see something that is not there or we may fail to see something that is there, or we may see something different from what is there. Our speakers first spent time explaining the fundamentals of the way vision works in the brain. Visual information comes in through the pupil, is translated into neurological information in the retina, goes to the thalmus, and then to the back of the brain where it arrives at the visual cortex. From there, the information goes to higher levels of the brain for processing. But it’s not a straight and accurate read. What we “see” is not always exactly what’s there. In other words, the brain elaborates on the information (stimuli) it receives from the eyes – completing images, filling in for missing information, interpreting, and smooths the edges. And it is on this nuance that illusions rely. Motion after effect. We stared at a rotating sphere within a sphere, up on the screen, for about 30 seconds and then shifted our gaze to the face of the person next to us – and their faces were swirling. Really. Rules of perspective. The way our brains see a vanishing point, where two parallel lines appear to converge at the horizon (e.g. railroad tracks). The image pair of the leaning tower of Pisa (at the top of this post) is a good example of manipulating the rules of perspective. 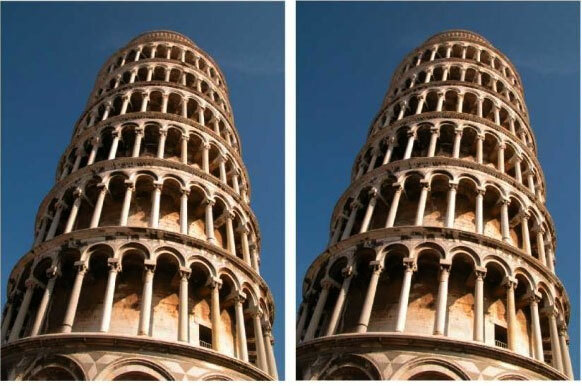 The images are identical but, to our eyes, the one on the right looks like it’s leaning farther to the right. That is our brain, seeing the two images as a single scene. Normally if we see two adjacent towers rising at the same angle, they appear to converge as they recede from view, due to perspective. So when we see two adjacent towers that appear to be parallel, the visual system assumes they must be diverging as they rise from view, and this is what we see. So this particular illusion speaks to one of the many ways our visual system works – treating two side-by-side images as if they are part of the same scene. 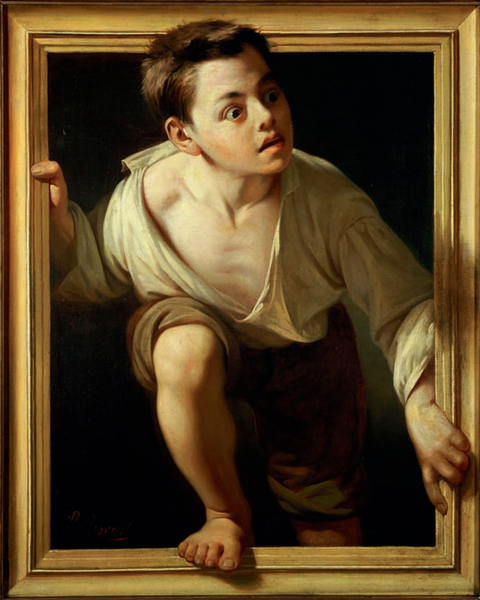 Trompe l’oeil: An art technique involving the use of extremely realistic imagery to give the illusion of three-dimensions. One example they showed is the cupola of the St. Ignatius of Loyola church in Rome – a ceiling painting, designed to look like a dome, even though there is no dome. Another example is the gallery in Palazzo Spada which appears to be 26 feet long when it is actually only 12 feet long. They’ve taken advantage of the principles of perspective, making the successive bordering pillars shorter, and thus making the corridor appear much longer than it is and the sculptures much larger than they actually are. Change blindness. You see something, there’s a disruption, and then you see it again but you don’t notice differences. Cue up the person swap illusion, constructed by the mentalist Derren Brown. In this movie, you see someone (the questioner) ask a stranger for directions. In the midst of the action, they are interrupted by someone walking by carrying a large painting, and the questioner is replaced by a completely different person, holding the same map. The stranger never seems to notice the switch. Even when the replacement questioner is a different gender! They go ahead and give their directions to the “new” person, without a hesitation. And here’s another video example of the same phenomenon. Inattentional blindness. Here is the classic movie to show demonstrate this one (I won’t give it away). The attentional spotlight – a method to dissociate your center of attention from your spotlight of gaze. As a demonstration of this, put your thumb out in front of you, arm held out straight – your thumb represents about .1% of your visual field and it is about the size of the fovea of your retina. That also means that you can only really accurately see with .1% of your visual field. What’s the evolutionary significance of this? To deceive! To distract others with your gaze, to misdirect them from our interest. When you pay attention to a given position, you enhance your perception of that position and you suppress attention to the surrounding areas (inhibitory neurons). This is why the people who are very good at counting the basketball passes in the earlier video are more likely to miss the gorilla. Macknik and Martinez-Conde work with professional magicians, in order to study their illusions and magic tricks. 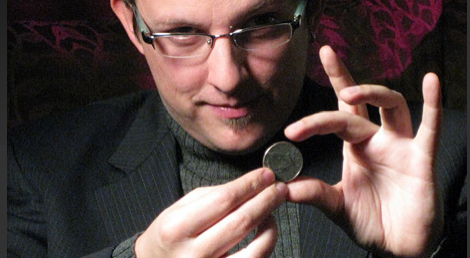 They work with the best – James Randi, Mac King, Johnny Thompson, and Penn and Teller. They see the magicians as true experimenters – constantly fine-tuning their work through experimentation with their audience. Magicians use special effects, misdirection of attention, memory illusions, optical illusions, and illusory correlations in their craft. And, most importantly, they are masterminds of human behavior. They regularly misdirect us using very simple techniques (beautifully executed). For instance time misdirection, top-down misdirection (intentionally distracting you with a detailed instruction), distributed attention (split the audience’s attention), inferred motion, social cues (gave, voice, body language), and comedy (they use laughter to reduce focused attention). One example of a typical magician’s technique they explained is the way they manipulate our smooth motion detection. Macknik and Martinez-Conde found, through their research, that when our eyes track something (the arched curve movement of a magician’s hand, for instance), there’s more than one type of brain cell at work. One type of neuron detects the motion, while the other suppresses the background. So your brain is actively suppressing parts of your visual field – ignoring the bits it doesn’t need – in order to more effectively follow the motion. Very cool. You can read more about Susana and Stephen’s work in this special issue of Scientific American Mind, 169 Best Illusions and a recent Scientific American article, The Top Ten Illusions. You can also see them at work in this NOVA special. And as teachers, they recommend reading the book The Five Points of Magic, by the magician Juan Tamariz, which is really about performance and relating to an audience. In addition to their work studying magicians, Macknik and Martinez-Conde organize an annual illusion contest that sounds like a lot of fun – The Best Illustion of the Year Contest. Held every year, since 2005, the contest brings illusions and magic out of the woodwork. Anyone can submit an illusion to the contest, a panel of experts pick the top ten illusions which are performed at the event and voted upon by the audience. The contest’s website is well worth a visit – have a look at the videos of the award-winning illusions. What a perfectly delightful evening! Sounds wonderful! Did you see this (sorta related… ok, not really)?